When the Trump administration is trying its best to save US jobs for Americans by restricting the inflow of foreign workers on H1B and other employment related visas, Indian American Jignesh Pandya from Philadelphia has come forward to create 17,800 jobs in the United States. A self-made business tycoon, Jignesh Pandya recently announced his plans to build eight cricket stadiums in USA. It is a $2.4 billion project. The other purpose is to professionalize cricket and heighten its popularity in the US. New York, New Jersey, Texas, California, Georgia, Florida, Illinois and Washington DC are the target locations for the eight cricket stadiums. Each stadium having a seating capacity for 26,000 will cost approximately $300, according to estimates. Direct and indirect salaries worth $800 billion will be generated from each stadium over a span of 20 years, according to Jignesh Pandya, the Chairman of Global Sports Ventures. The proposed cricket stadiums in USA will be modeled as multi-purpose entertainment and lifestyle centers. It is expected that each stadium will create employment for 725 workers in construction and 1500 workers on a permanent basis. A press release from Global Sports Ventures states that America will see job opportunities in sports tourism, coaching and training, merchandising, security, logistics and transportation, hospitality, media and broadcasting once the $2.4-billion project is completed. Philadelphia-based Jignesh Pandya is a sports enthusiast. He is a die-hard supporter of cricket. He believes that Americans are the greatest sports lovers in the world. The United States’ sports economy is valued at a whopping $87 billion, while the sports economy of India stands at a nascent stage only for $6 billion. Indian American Jignesh Pandya’s proposal to build 8 cricket stadiums is likely to boost the US economy in sports. The founder and chairman of the Rohan Group headquartered in Philadelphia, Jignesh Pandya watches international cricket matches in different parts of the world. He observes that a majority of the audience is from USA. The US has a huge market for cricket, which is to be explored for an economic boost. Over 1.4 million people across the US watched the ICC World Twenty20 tournament in 2016. Cricket used to enjoy immense popularity in America before the Civil War. George Washington, a cricket lover, played the sport in Valley Forge, Pennsylvania, in 1778. A cricket match between USA and Canada was the first international sports competition, according to the United States of America Cricket Association (USACA). 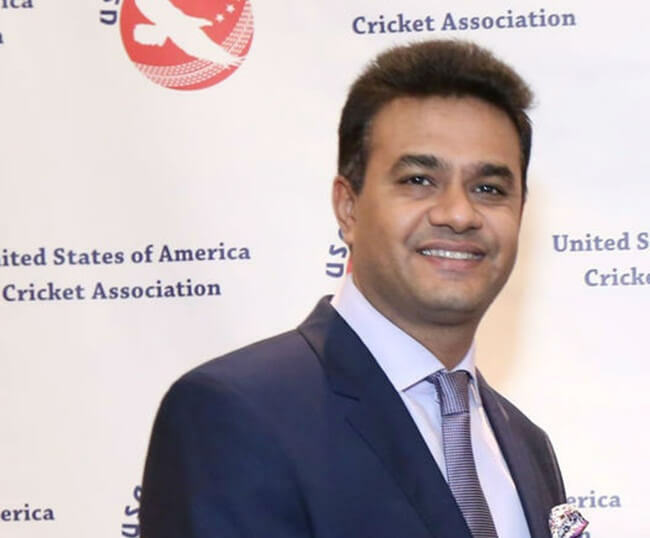 Global Sports Ventures’ $70 million multi-year licensing agreement with USACA is the first significant step towards restoring the glory of cricket in the US. Indian American Jignesh Pandya, a self-made billionaire, is a philanthropist too. He immigrated to USA at the age of 15 and got into retail business when he was 19 years old. Then he ventured into commercial real estate and gradually built an empire across the East coast. He supports the World Hunger Organization’s mission to eradicate hunger by donating to distribute free meals to the needy. He feels privileged to give back to the community. Travel Beats is a leading Indian American portal by Indian Eagle, a trusted partner of Indians in USA for booking their flights to India. Subscribe to Travel Beats’ free newsletter for the latest immigration, visa, air travel and community news. Appreciate your idea to build the cricket stadium in Atlanta, GA. Thousands of Indians live in North and North East of Atlanta due to the IT jobs – Silicon valley of the East. So to get the best attendance build the stadium in Suwanee, Johns Creek, Duluth, Alpharetta or Roswell area. Please do not put the stadium in downtown or midtown of Atlanta that will reduce the attendance and income generated because people do not want to go to downtown or midtown due to the big commute of 30-40 miles. Thousands of Indians are moving to Atlanta now and in future due to the IT jobs as well as the affordable housing and moderate climate in Atlanta. So your idea to put a cricket stadium is a great milestone in Atlanta, GA and for your grand success in this venture. Jigneshbhai it’s a Gr8 idea. Wish U All the Best. Panjim – Goa – India. I wish u warms best luck and proud for you’re project in USA.i am also die hard fan of cricket.i like your wonderful plan. I am curious to know why he has to build it as cricket stadiums. Why not normal sports stadiums where you cwn play all kinds of sports? And mostly Americans are keen in basketball football and baseball and others too not likely cricket only I believe. He is not thinking in terms of Social Service, he is JUST thinking this as a Business Opportunity. very good idea .i played cricket from gujarat ranjitrophy and i went to england to play in 1985 with my team . we played league cricket in england. Very nice idea. Can you have a stadium in saint louis that is geagraphically Centrallly located. The enthusiasm and traction for cricket is extraordinary here. There is not only abundant need for a cricket stadium but tremendous scope for commercialiazing. Good luck, Jignesh. India as 52 stadium, while other countries are having 8-12 stadium. So by building 8 stadium, cricket association will definitely generate jobs and revenue to US. Recent popularity of IPL, CPL Big lash. We can also offer other countries and leagues to play in USA. Same as Dubai and Sharajah hosting game and leagues.